As title says, I’ve managed to add support in DroidTerm and UsbSerial for those cheap Arduino clones which use the Ch34x family usb to serial chipsets (thanks Paul for providing me with one). – A bug that appeared when a CDC device connection was disconnected and reconnected without unplugging. 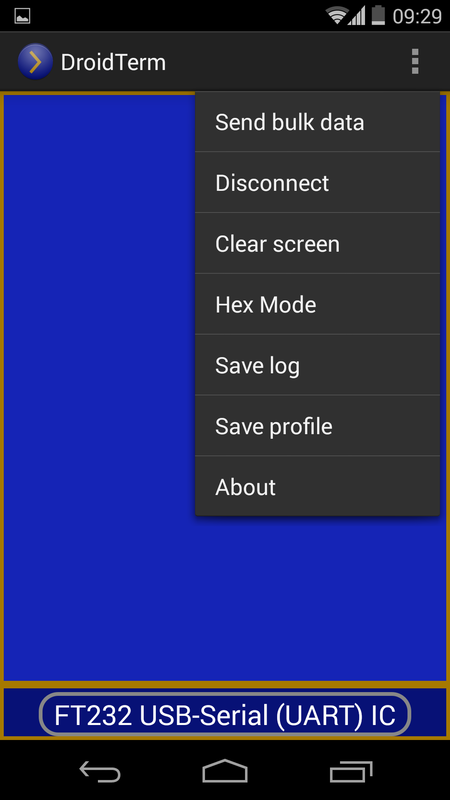 – Now DroidTerm keeps logging data (if a profile was created) when the screen is turned off. I hope DroidTerm is still useful for you guys and I hope I could start to add some new features soon. I start this new year with a new DroidTerm update. Every month this little utility is getting more and more useful and reliable. Today I am going to present two new features I added some weeks ago but I didn’t document anywhere. 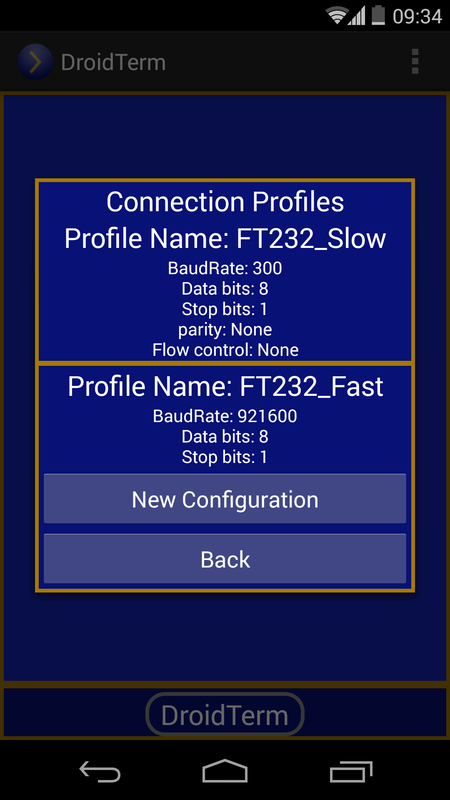 Since v5.0 DroidTerm allows to create connection profiles avoiding annoying configuration setup each time you connect your devices. 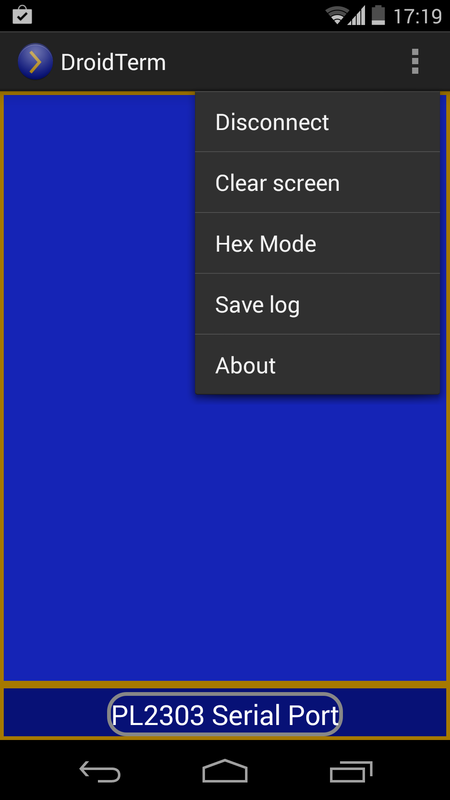 DroidTerm v6.2 creates a log file each time a connection profile is created and that file is updated (opened, written and closed, so synchronization with cloud services like Dropbox is possible) every time something is received. It is still possible to save logs the same way, even if you are working within a connection profile. I have released a new version of DroidTerm. It fixes some bugs and I consider it fairly stable right now but besides typical bug fixing I added a new feature some of you considered a nice one and I really agree with you. Now It is possible to save connection profiles in order to allow a faster start. The process is pretty simple. Click on “Save Profile”, Give it a fancy name and save it. Your profile will be stored with your current connection settings and It will available next time. This dialog will appear if you try to connect a new device and You have at least one stored profile for that device (profiles are associated with a pair of numbers called VID and PID which identify a given device). Some weeks ago I uploaded a new version of DroidTerm with some improvements. One of these improvements was a log system to save your session. Well I made some changes that allow view your logs inside your app. Press “Log Viewer” and choose your log. I added a new way to send data. 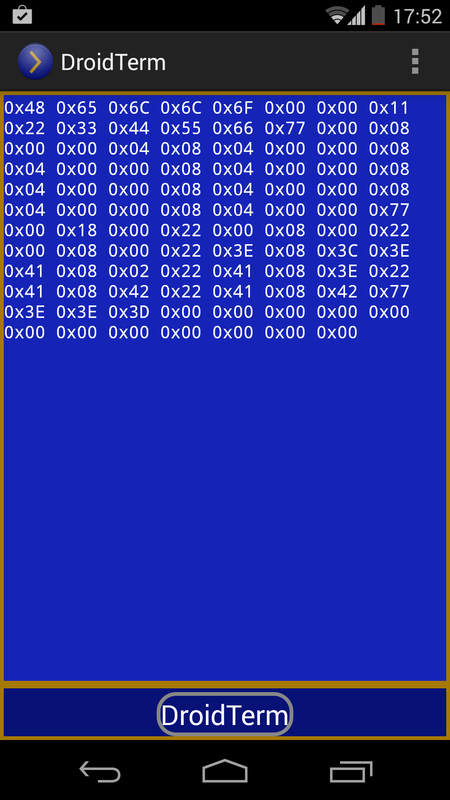 In prior versions users had to click on terminal and send one character at a time. This way is not gone but now it is possible to send more data at a time. I uploaded a new version of DroidTerm some days ago with some changes I would like to share with you. 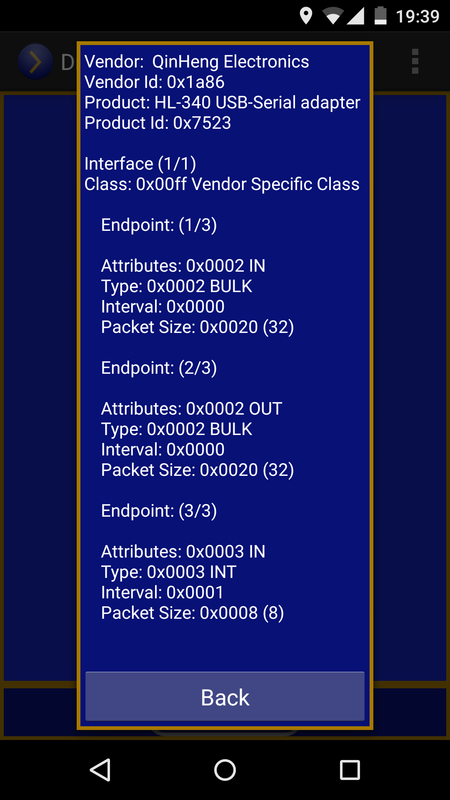 First of all, I decided to drop Bluetooth SPP (Serial Port Profile) support from DroidTerm. 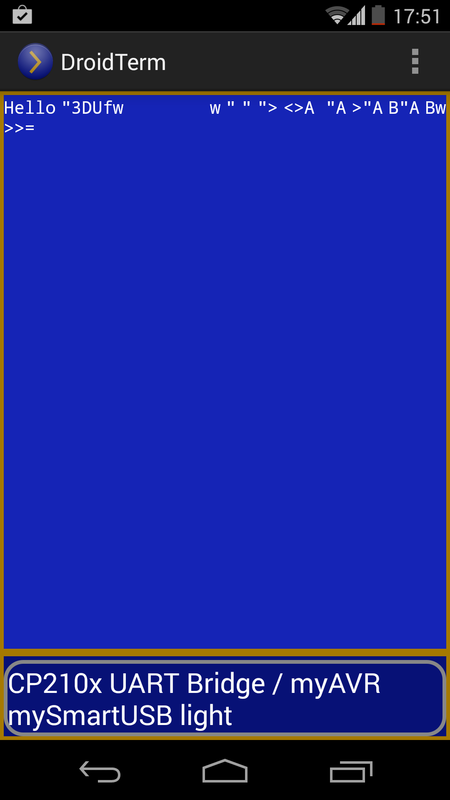 I did not consider it my first goal when I started to develop my app. 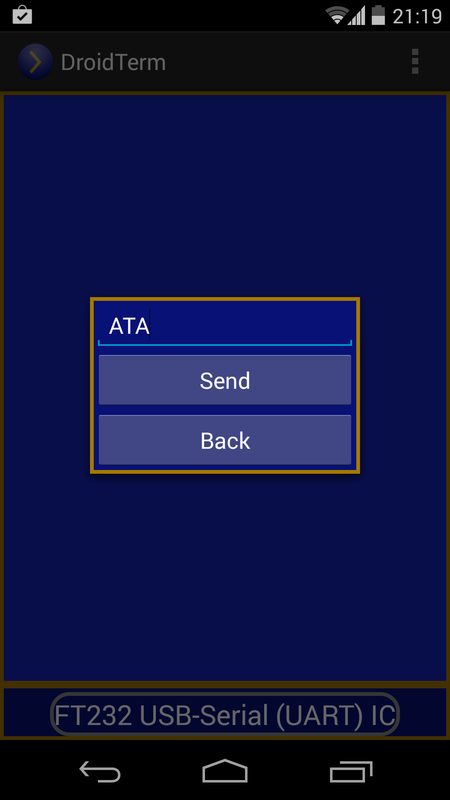 I was struggling to find a great replacement in Android for Putty as a serial terminal so that became my first objective and, eventually, I decided to add support of Bluetooth SPP because it would be a not difficult task. Months later I spent hours refining the USB serial interface of DroidTerm adding devices, fixing bugs… so now It is pretty stable. Unfortunately I almost forgot completely about bluetooth. So it was not so stable at all and I have decide to focus on USB stuff. – Connect your USB-Serial device and configure it as you want. 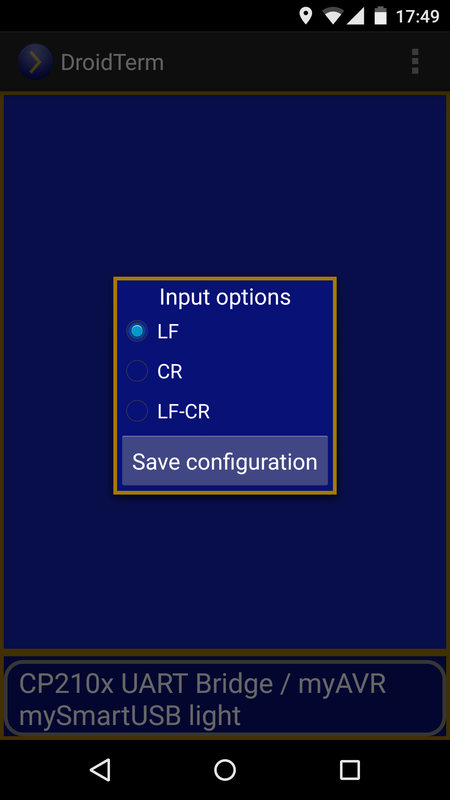 – Press options button whenever you want. The text files generated by DroidTerm save not only raw data (Text or Hex representation as We will see next) but metadata of session too. The next improvement, as you may noticed before, is a Hexadecimal representation of received data. I missed that really useful feature when you are debugging, or gaining understanding of a protocol and you need the raw data. I have more improvements in mind but They will have to wait for a next release.